Fast and compliant notes, it seems impossible but Instinctive Notes is built to do both for you. Stop wasting your time with slow note taking software or paper notes, you've got better things to do. Instinctive Notes is a native iOS application. 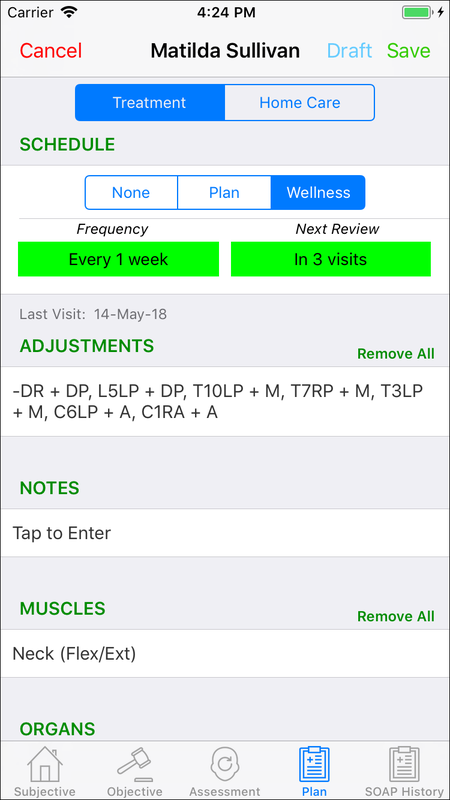 That means it's optimised to make use of all the power of the iPhone or iPad, and give you the fastest and most responsive clinical notes available. The most important data is stored directly on your device so that it is avaialable at a tap of your finger. You can review your upcoming appointments and client history no matter where you are. The speed advantage doesn't stop there, Instinctive Notes even works if you have no internet access. All appointments and client history is fully cached for the upcoming 2 days so that you can take notes even without connectivity. Compare that to using a service that stops when your internet isn't available and the advantage becomes infinite. Standard codes for adjustments made during treatments are arranged into easy to access screens. Smart double tap options and sub lists make getting to the detail painless. Build your own custom codes screens exactly the way you want. Recording your specific requirements is just as fast as any standard codes. Pick lists exist across the App, with many having smart sub lists. Favourites float to the top to make picking what you want even easier. Test and muscle customisation allows faster access and control to recording results. Even faster than tapping codes and lists is tapping nothing at all. Treating a patient often involves similar adjustments each time you see them, so we copy treatment details from the previous note to speed everything up. Adjustment codes, muscle treatments and prescribed exercises are auto copied. Simply review, make changes and save - your note is recorded faster than ever. Any open patient complaints are auto linked to every note recorded while the complaint is active. Now you'll know exactly what complaints are being treated every time you see a patient. Any changes to the complaints are recorded to give you a complete complaint history, and the new details are linked to notes from that point onwards. When your patient is ready just resolve the complaint to remove it from future notes. There is no ambiguity about when you started and stopped treating a particular complaint. 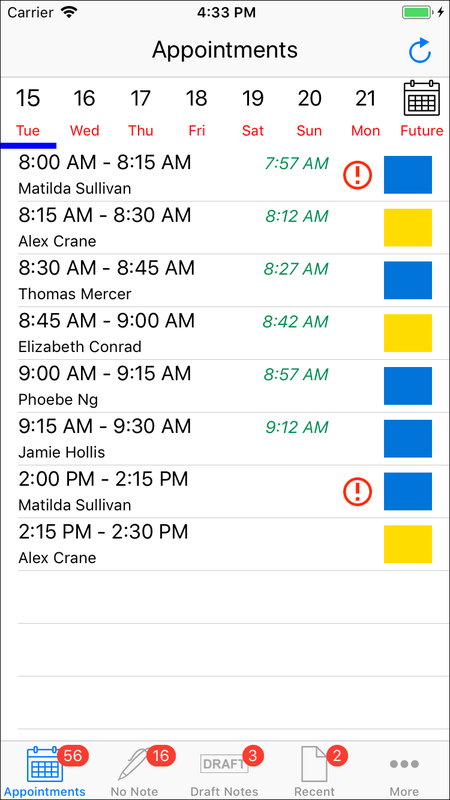 It's full complaint management built right into your note taking process, with a minimum of effort. Customise Instinctive Notes to suit your particular specialities and the way you work and enjoy another speed bump. Set up to four codes templates to use to capture your treatments. Any mix of standard and custom templates can be added. Get a quick start by using standard codes templates. Diversified, Gonstead, Applied Kinesiology, SOT, Thompson and ABC Protocol are built right into Instinctive Notes. Build custom codes screens to meet your specific requirements. For maximum control custom codes are standardised across your practice, they always mean the same thing no matter who uses them. 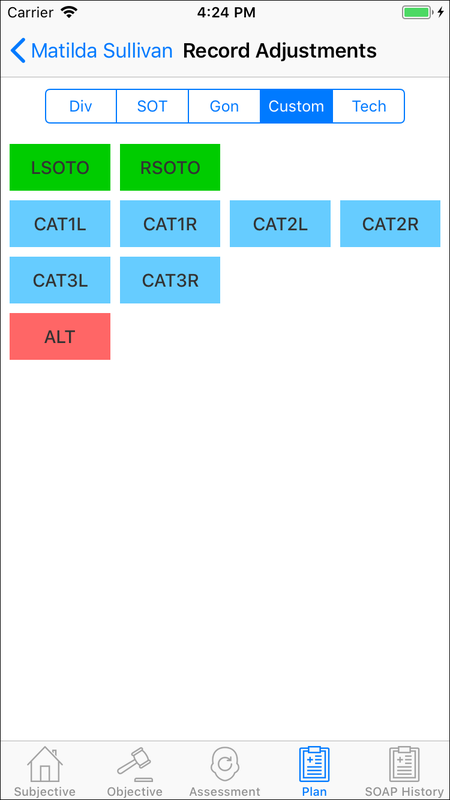 Arrange custom codes into personal screens of up to 40 codes with their own order and colours. Focus on the tests that you use the most by hiding the tests that you never use. The reduced test list is easier to navigate and select from. Choose favourites in many lists to push those items to the top. The reduced scrolling means faster selection. Built in text expansion can cut down your typing significantly. Just set a code and the words it represents, then type the code in a text field and it will explode out the words. Essential time saving if you find yourself typing the same things over and over. Build in dictation means you can speak your general notes and they will be turned to text automatically. For long sentences this can reduce note taking time substantially. Like to handwrite your notes, there is even a custom iOS keyboard available which lets you do that. So no matter what text you need to write you can always get it down fast.